Listed among Lee’s accolades are: starred reviews, New York Times best illustrator status, children’s book of the year winners, gold medal illustrator, and award winners of multiple prestigious national book competitions—to name but a few —for her previous publications Wave (2008) and Shadow (2010). Lines is sure to deliver the same caliber response. With delightful ease, Lee sells a wordless yet readable story. Simple and elegant in its delivery, the reader does not so much read this story in the traditional sense, as admire the calligraphy of the storytelling. Artistic eloquence dominates with abundant energy, character, conflict, emotion, and surprise tucked in. 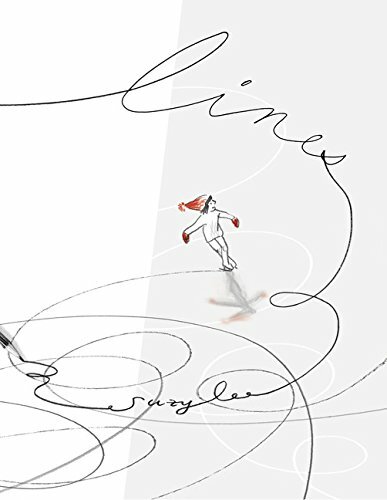 Lee begins the show with a single penciled diagonal line, pulled across a plain white page in the wake of the momentum of the single skate of a gracefully balanced ice skater. The skater, also a mere pencil sketch with a red knit pom-pom cap and mittens, then gets more and more bold in her footwork, her line-work. The edges of her skates leave swirl upon swirl edged into the ice of the paper. She twirls, jumps, spins, and loops fancy script-like letters S and O. Muted charcoal lines swoosh between bold and thin, skate along between wispy and solid. She dances, master of the ice, covering the page with control and command. Until she takes a tumble and scrunches up the paper into a ball only to be tossed down near eraser shavings and a dull-tipped pencil. The pencil artist, frustrated she may be, cannot leave the paper alone. Something beckons a revival and the crumpled paper is pressed out against the surface, wrinkles on the ice/paper creating a bit of a dilemma for the skater. She sits there, staring at her red hat, which has come off, surrounded by a landscape in desperate need of a good Zamboni-ing. Suddenly, in slides a new skater on his tush. Then another, spinning on his back; then two more in uncontrolled slip-slides; then a spread-eagled dog. In a flash, the wide panorama reveals an entire village of young skaters making use of the ice/paper. Splashes of bright colored hats, mittens, scarves, and coats stand out against the monotone sketch. Snowballs, frisky chases, and skating pairs all occupy the space. The snow fun is not relegated to the ice. Along the fringes a group builds a snowman, skates get laced, spectators watch. One newcomer of notice is extending a hand to help up our tumbled red-hatted figure skater to her feet. Another line of sorts is being formed as dozens of skaters link up hands to shoulders to form a long chain, which loops as one unit around the rink. The group carries on with their games and the reader is left feeling all of the frosty chill, invigoration and merriment of the winter scene . . . all of this from just a simple, ordinary line. Lines is subdued, yet powerful. Muted, yet vibrant. Classic, but fresh. In essence, a work of art.